In the race for USA Green card, EB-5 investors always win as it is the fastest way to get a Permanent residency in the USA. Along with the criteria of investing in a new commercial enterprise and creating 10 jobs for US citizens, EB-5 law also states that the investment has to be ‘At Risk’. To understand the Risk involved in any EB-5 Project we have some examples for you. 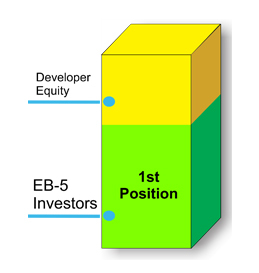 Figure 1 shows the traditional EB-5 capital stack. 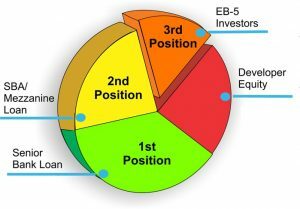 This is the general structure used in the EB-5 market today. At the bottom is what we call the Senior Lien or First Position held by a Bank. Above that is the EB-5 Capital in the Second Position, and above it, the Developer Equity. This can be seen as a hierarchy in the event of a bankruptcy or project failure. In US bankruptcy law, whomever holds the 1st position has control over what happens to the asset and where the money goes after liquidation. In this case, the bank has absolute control and can legally choose to wipe the investors out. The investor will lose out on their money as the Bank takes over, to cover its own project investment capital. developers and Regional Centers will use a pie chart instead. If an investor does not know where the stack begins and ends, then how can they know if their investment is safe or not? In most cases involving a pie graph, there is more than one entity with a claim to the asset ahead of EB-5. In this case, there is a bank loan first and behind that another loan taken out by the developer, before EB-5. If the project failed here, the bank would have first claim to funds, and if anything is left, then the second loan would have cliam leaving a little possibility of the investors seeing their money returned in the third postion. 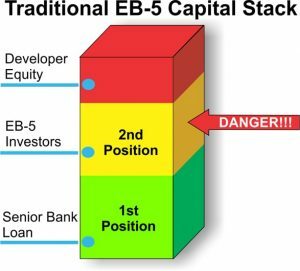 As we studied earlier, the traditional model of EB-5 is very dangerous for the Investors.It is very important to know where your investment lies in the Capital Stack of the project.The BTUSA EB-5 Model gives you a very clear and safe structure. Since we are a commercial lender, we view the investment from a financial standpoint and use EB-5 as a lending platform. As soon as an investor wants to file EB-5 Investor Visa with us, we create an LLLP (Limited Liability Limited Partnership) firm, where LD Capital Bridge To USA becomes the General Partner and all the investors are Limited Partners. This LLLP gives EB-5 loan to the developer for a specific project. Therefore, all our Investors become the Bank and enjoy First Position in the Capital stack. 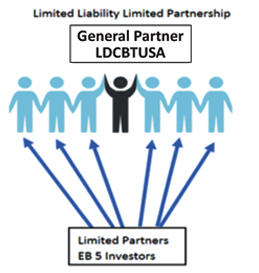 Rather than raise EB-5 funds for equity (which is mostly at higher risk) like other Regional Centers, we at LD Capital market a debt raise for EB-5 funds which moves our investors into the First Position! actually have our hospitality management team take over the asset if the developer fails, on account of us being the bank. This team can operate the hotel and continue the EB-5 process to fruition for the return on investment and receipt of permanent green cards.